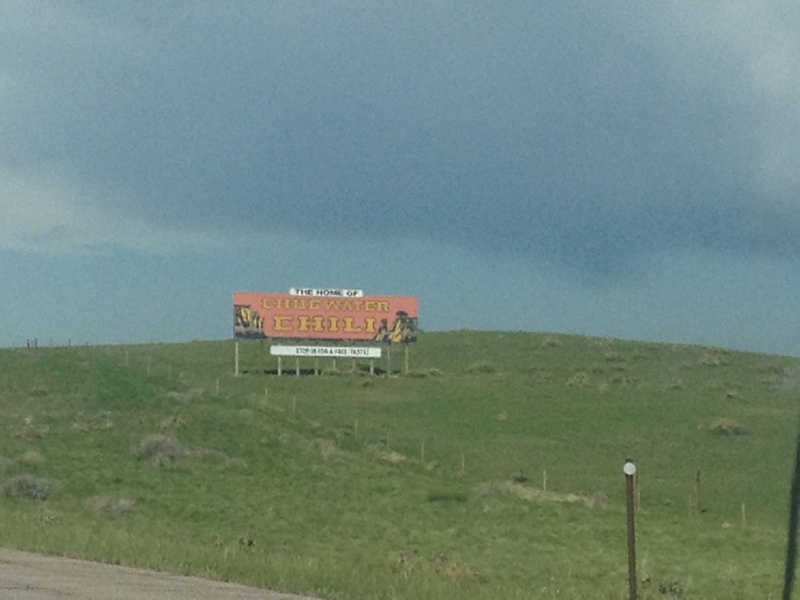 Chugwater, Wyoming is not known for tornadoes, nor is it known for UFOs. When people think of major tornadoes, they typically think of places like Oklahoma and the rest of the Great Plains. Most consider “tornado alley” to be to the east of Wyoming. Likewise, when people think of UFOs, the town of Roswell, New Mexico comes to mind, as it is not only the location of a major event related to UFO conspiracy theories, but also in a region dense with UFO reports. Chugwater is a town of barely more than 200 people roughly 40 miles north of Cheyenne. The only thing it is really known for is chili. I have never actually tasted Chugwater Chili, but others have told me that it is really good. Enough people like it to support an annual chili cook-off in the town, which has been going on for twenty-nine years! 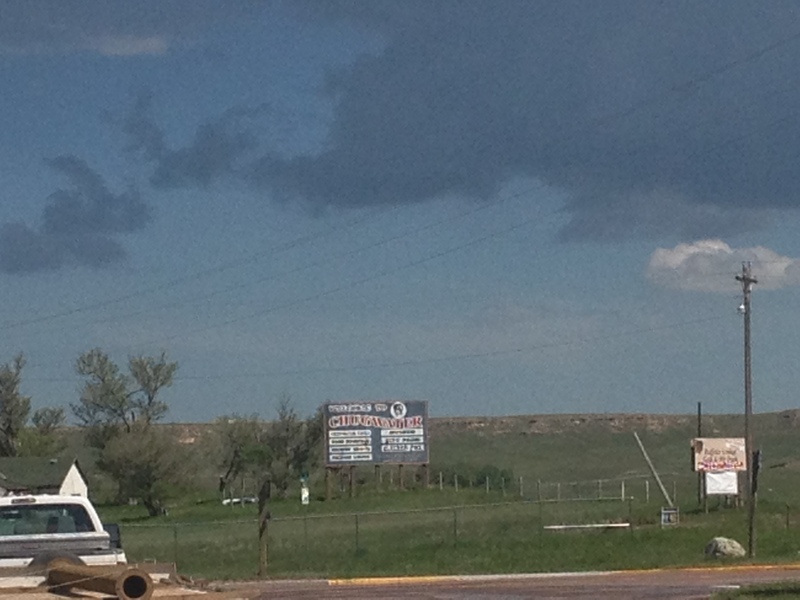 However, yesterday, the last day of May, a trip to Chugwater helped shed some light on both phenomenon. 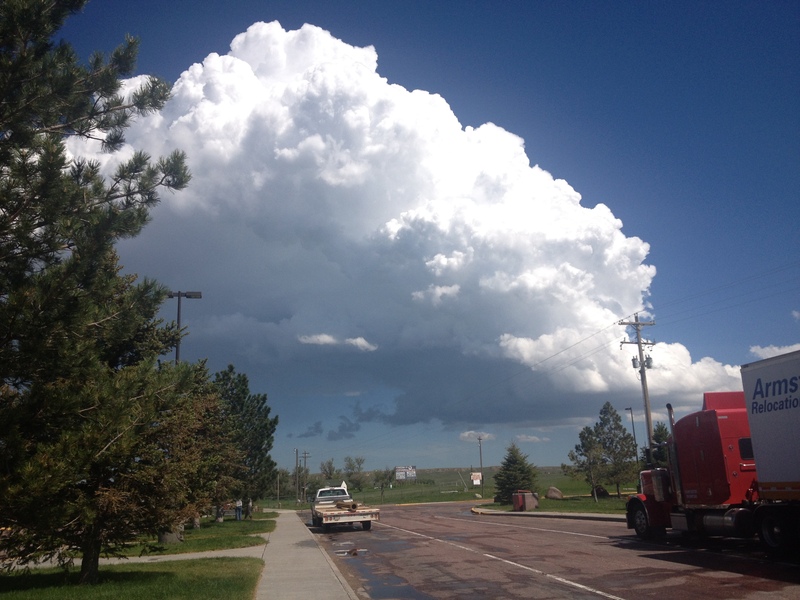 It was a day where thunderstorms fired up across a wide area that stretched all the way from Saskatchewan to just southwest of Colorado Springs. 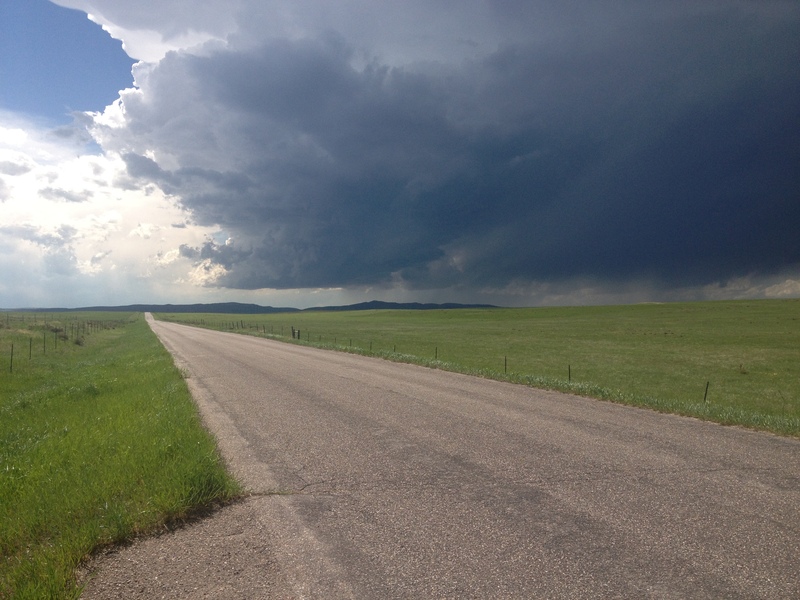 After an examination of weather conditions, we determined that the best possible conditions for seeing some good thunderstorms within a reasonable drive of Denver would be in Southeast Wyoming. In the early part of the afternoon, a series of storms popped up in the region, but fizzled out and died fairly quickly. 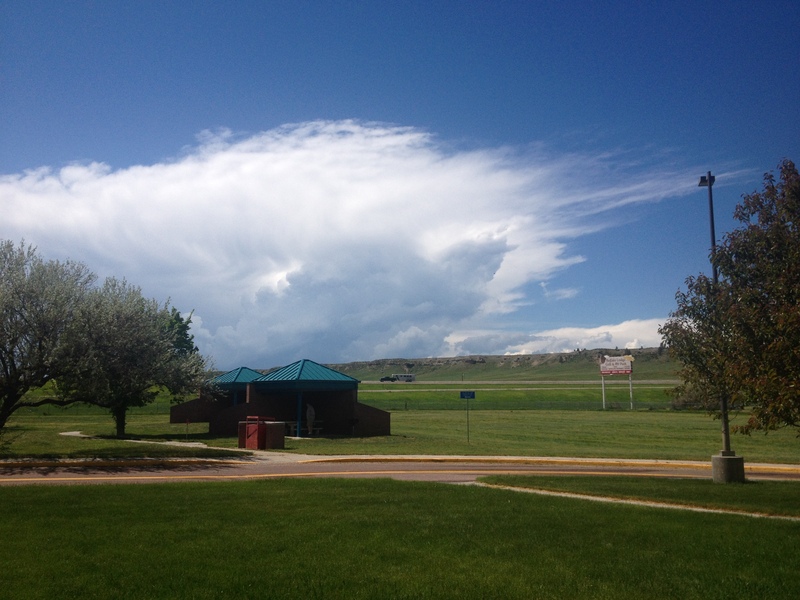 It was not until mid-afternoon when we finally encountered a major storm brewing over the Laramie Mountains to the west of Chugwater. From a hill just to the west of town, we were able to observe this storm gradually move towards us as the afternoon progressed. The entire day felt quite strange to me. In every single way, it felt like a typical storm chase. The procedure of heading towards an initial target location, then heading towards a storm as it forms, and observing it along a country road was exactly as I had done probably close to 100 times throughout my lifetime. The air felt warm and moist, and the wind picked up as the storm approached, just as I had always remembered it. Even the ground looked as green as it had looked in most of my chases in places like Iowa, Nebraska, Kansas, and even Illinois. However, this was Wyoming. 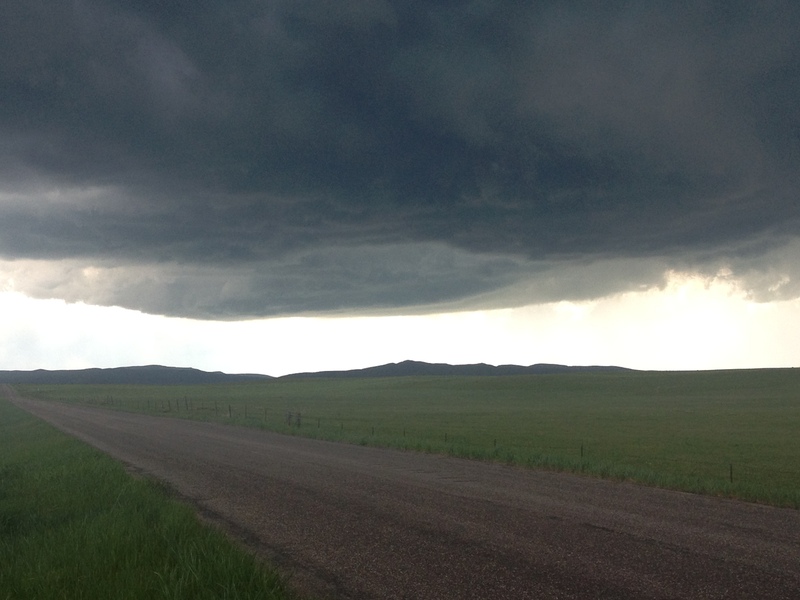 What we were observing today is quite atypical for Wyoming. The ground, typically quite brown here, had turned green due to a recent uncharacteristically rainy period. Additionally, it was quite moist that day, also atypical for the region. All the conditions had come together to produce a scene, and event, and a feeling, that felt way more like Kansas, or even Oklahoma, than Wyoming. However, this region is still naturally dry, and as the storm developed, the somewhat random mixing of moist and dry air produced a somewhat chaotic storm structure. For a period of time the storm structured itself in a manner that looked quite like a UFO. Well, at least it looked like a UFO in the way it is typically portrayed in the movies; a gigantic circular object with a hole in the middle (the hole being where the aliens come down and abduct the humans in many scenarios). The other major difference between this chase and a typical chase is the presence of mountains. The mountains seen in the background of these pictures, which are facing West-North-West, are not nearly as tall as some of the region’s bigger mountains. However, contemplating this UFO-like shape in the cloud feature did make me wonder if a similar phenomenon in Southern New Mexico, which also has a dry climate and more modest sized mountains, could explain some of the UFO sightings there. Of course, there are many theories behind not only UFO spottings, but any observation that does not appear to be sufficiently explained. The world often appears to operate in a manner that seems inconsistent with what we have been told by official sources, experts, and authority figures. This is the primary driver of conspiracy theories. While these theories largely have not been verified, I do sympathize with the intellectual curiosity that often leads people to explore these theories as a possible explanation for what they are observing in life. 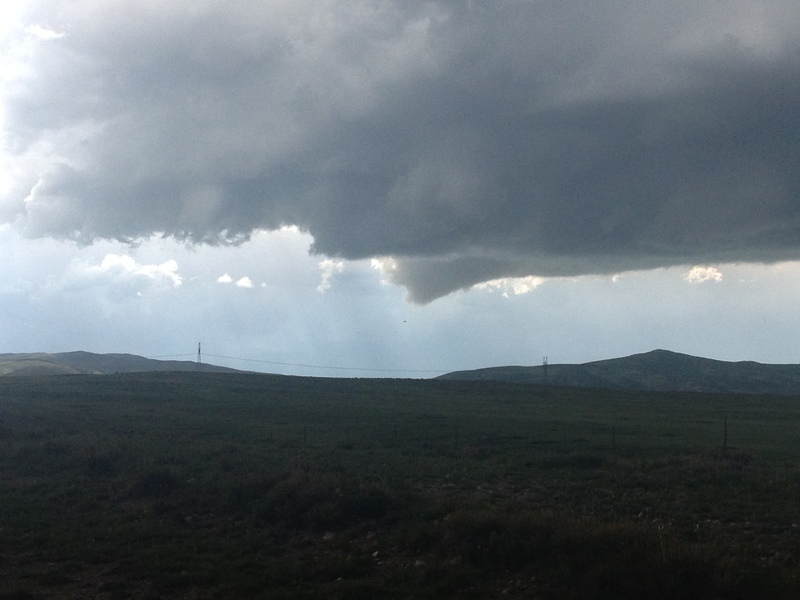 Roughly half an hour after the storm’s “UFO” phase, it produced a funnel cloud. A funnel cloud is the beginning phase of a tornado. However, not all funnel clouds reach the ground and produce tornadoes. The reasons as to why some storms with the same rotation produce active, life-threatening, tornadoes while others don’t has been the subject of scientific research for decades. 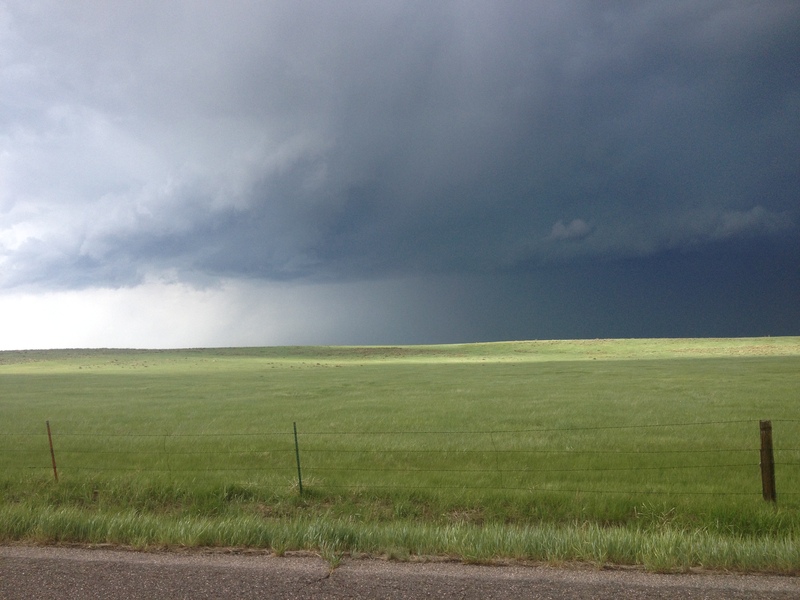 I’m not going to figure this out by staring at this storm west of Chugwater. I just came here because I love storms. 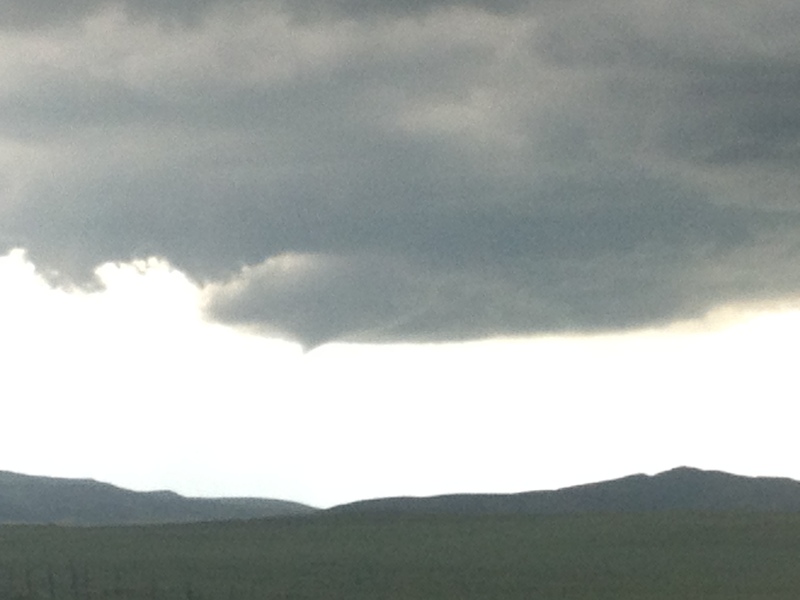 After about 10 minutes the funnel dissipated, without producing a tornado. As the storm began to produce greater and greater amounts of rainfall, it got darker, making the storm features harder to see. 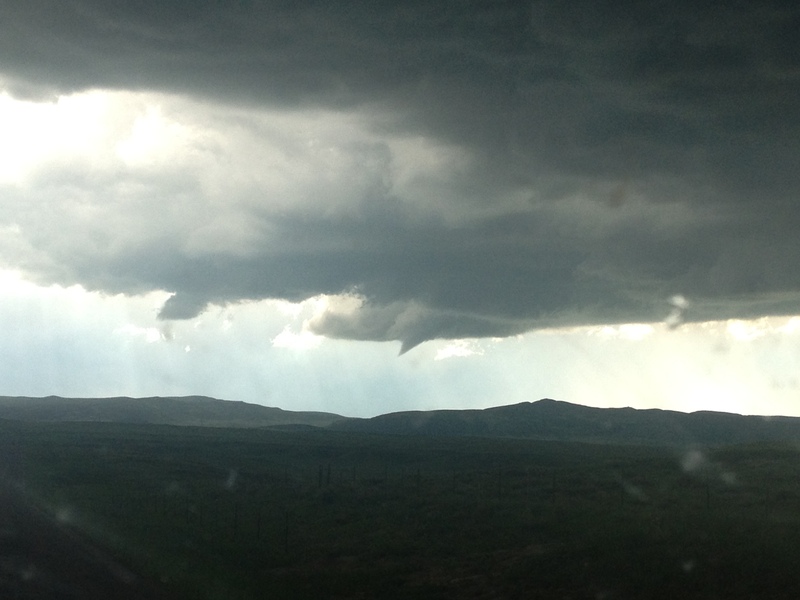 This prompted us to go home, as we were already quite satisfied to have seen a funnel cloud. 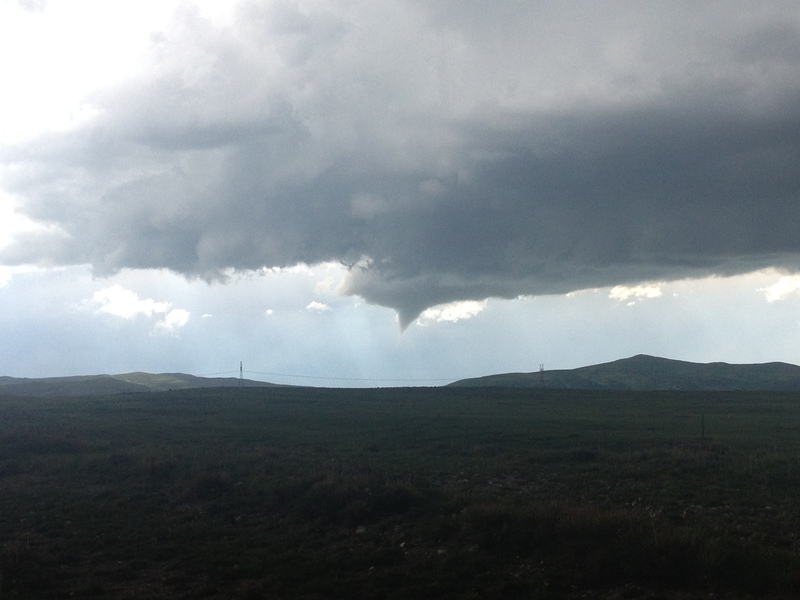 In fact, this was the first time I got a picture of a funnel with mountains in the background. This trip to Chugwater reminded me that every location has a story. Even if a place seems boring, quiet, and insignificant, there is still the potential for something quite amazing to happen there, and there is still the potential for answers to some of life’s important questions to be found there. Prior to 1947, I doubt too many people knew where Roswell, New Mexico was, or ever really thought about the place. Now, a lot of people think of it whenever they think about aliens and UFOs. While Roswell did not answer anything there are plenty of events occurring in all sorts of places around the world that may offer us answers to all kind of questions from curing diseases to questions of sociological and genetic nature. What other obscure location could have the answers to some of the most pressing question of our day? And, how do we go about finding it? 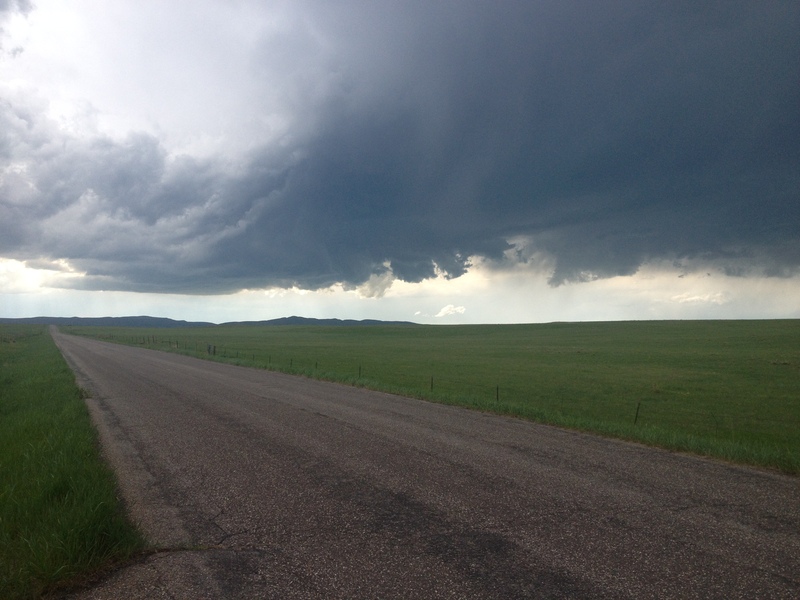 This entry was posted in conspiracy theories, Scientific Phenomenon, Storm Chasing, UFOs, weather, Wyoming and tagged Chugwater, Chugwater Chili, conspiracy theories, Funnel Clouds, Storm Chasing, storns, UFOs, Wyoming on June 1, 2014 by Stephen Jaye.